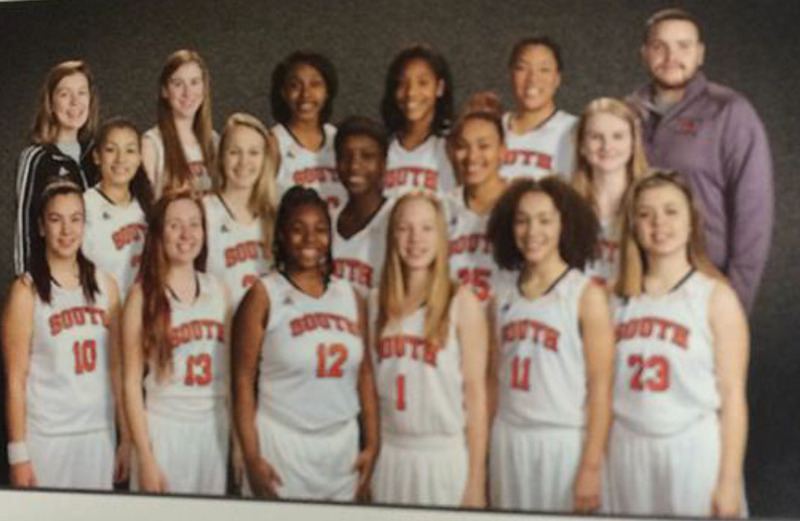 2014-2015 Varsity Team Photo: There were no names listed in the 2015 South yearbook. Head Coach Tanysha Scott began her second year leading the Tigers. Hope was high that the Tigers would improve over their prior season’s record. Coach Scott was assisted by Amin Borji, Bradford Dobbins, Channcee Hollingsworth and Derrick Turne. The team began the season against Richfield. Richfield slowed the Tigers down and won 72-54. The second game was against Robbinsdale Cooper. The Tigers showed their grit and won by 10, 72-62. The Conference season opened quickly. Edison was the first opponent. The Tigers ran all over the Tommies to a 75-52 win. Washburn was considered the pre-season favorite to win the Conference Championship. The game was very close, but the Millers came out on top, winning 68-63. Defense was not the norm in the Tigers game against Southwest. The Tigers out-scored the Lakers 89-82. The Tigers destroyed St. Paul Highland Park, winning by 47, 78-31. North was the last game before Winter Break began. This too was a close game, unfortunately, North won 51-47. During break, South played in a tournament, splitting the two games. They lost to St. Paul Central 74-41 and defeated Robbinsdale Cooper the next day 54-50. After break, the Tigers went on an eight-game winning streak. West Lutheran was the first team to fall, 77-50. Roosevelt lost 56-42. Stillwater and South played a very close game with the Tigers winning 58-52. Henry lost next, 71-49. Mahtomedi fell by eight, 69-61. St. Paul Academy lost by 35, 86-51. Edison lost by 20, 77-57. The next game was against Washburn. The game was as close as any basketball game could be. The teams exchanged leads. It seemed that the team with the ball last would win. South came out on top by a 57-56 score. The next game was against Southwest. Both teams were one game behind conference-leading Washburn. Like in the Washburn game, this game was as close as any basketball game could be. The teams exchanged leads. Again, it seemed that the team with the ball last would win. This time, South came out on the wrong end of the 61-60 score. The last month of the season began with a loss to Lester Prairie, 71-61. The team bounced back and earned revenge against North and won 70-63. A loss to Minnehaha Academy, 84-53, came next. A modest three-game winning streak started with the Tigers beating Roosevelt 73-41. Spectrum fell 61-42. An 89-58 victory against Henry closed out the Conference season. The team finished the regular season splitting two non-conference games. They lost to Waconia 99-80 and defeated Columbia Heights 78-67. The Tigers played only one Region game and lost 85-60 to Eden Prairie. The team finished the Conference season with a 9-3 record, giving them a tie for second place with Southwest. Overall the team finished with an 18-9 record. The JV finished with a 10-2 record, good for second place. Overall, they were 16-10. The C-Squad spent the season learning and improving. Their Conference record was 2-8. Overall, the C-Squad was 7-15. Three players were named to the All-Conference team, Morgan Hill, Adra Stewart and Lexus Hughes.